We loooove nice boats! 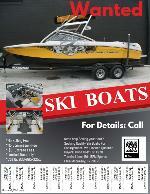 RPMSPORTS sells ONLY nice boats! We want them at trade in to be showroom condition. If they aren’t we make them showroom condition. We want our customers to feel they just bought a brand new boat even though it’s used. This one is no different. Can you believe it….only 72 hrs of run time. Think how many hours were spent parking, swimming, fishing, drinking beer, etc. That’s what boating is all about, to have a fun day with your family. This boat is absolutely perfect for that. Great sound system and plenty of room to dance if you want to dance while cruising at 30 MPH. It’s sooooo smooth riding! Everything is super nice and this engine runs perfect. The prop is stainless and looks brand new as well, not a mark on it. You cant go wrong with this one especially buying it from RPMSPORTS. Unbeatable financing guaranteed, insurance on the spot which is also unbeatable. You get to instantly test drive before you buy. Try to find another boat outlet that can do all of that for you and with no resistance. All boat dealer in cities refuse strongly to go for a test drive. It takes them 4 hours on the average to do that with no guaranty you will purchase. That makes a huge difference on where you want to purchase your next boat. Call us at 830 865 3251 or email pat@rpmsports.com or sales@rpmsports.com or manny@rpmsports.com.